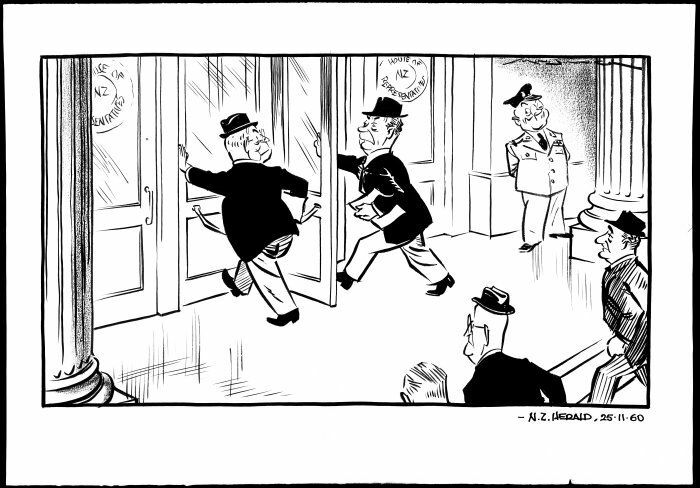 Keith Holyoake and Walter Nash are both trying to enter the House of Representatives at the same time, Nash trying to push the revolving door to the left and Holyoake trying to push it to the right. Arnold Nordmeyer and Jack Marshall are amongst the bystanders. Reference Number: B-056-104, Minhinnick, Gordon (Sir), 1902-1992. New Zealand Herald, 25 November 1960. Being a somewhat ‘political animal’ my curiosity as to where Molly Whitelaw sat on the political fence has been at the forefront of my mind as I research her life. Finally, all has been revealed! A letter written to her son, Alastair, 22 November 1960, gave me further insight into her values and beliefs as they have formulated from the outset of my research. ‘WELL! NATIONAL IS IN, with 39 certain, 2 probable. LABOUR IS OUT, with 31 certain, 2 probable. Whether her son agreed with his mother’s sentiments is another matter. A letter earlier in 1960 from her brother Alastair suggests otherwise. ‘ He [son Alastair] seems to belong to the Liberal leftish persuasion.’ The two Alastair’s apparently ‘always had tremendous arguments’. Son Alastair ‘implicitly believes in the power of ‘Democracy’ to solve all ills on the political plane’, writes Molly’s brother, who considered Democracy was in decline, dying in ‘seeds of its own defeat.’ What was lacking, he considered was ‘True leadership, GOD-inspired Rulership…’ in fact, along with a ‘united Christendom’, and ‘a stability of character in the people’, which was dissipating he concluded. I have found myself pondering on both Molly and her brother’s comments in light of New Zealand’s most recent General Election and the possible outcomes from the MMP process of electoral parties negotiations and compromises. For most who participated in the democratic process, these negotiations create tension. There will be many who will be delighted with the final decision – if it agrees with how they voted; there will be those who will express apprehensive as to whether the compromise reached are to their satisfaction; and those who feel let down even angry, and many emotions in between. We cannot avoid acknowledging that political decisions influence us whether we want to recognise it or not and these decisions and the results will have some affect on our view of the world around us. But what is it that influences our personal political decisions? They are, of course, many and varied and generally founded on a multitude of influences that impinge on our everyday personal and public lives. Our innate ‘tribal’ instincts come into play; where and what we have taken on board from our parents and their parents; how well we have prospered or not prospered in our daily life and when, where, why and how this occurred; how we perceive our own place within our families, communities, society, the nation and the world. Our responses will also reflect the values we hold about the ‘other’ in relation to ourselves. As I delve further into ‘finding’ Molly, these avenues of influence will require considerable exploration, further reading and analysis. But what a lot of fun!